The CND ATIS system provides a fully automatic ICAO Annex 11 ATIS with extensive display and customization facilities using a multi-tab operator management screen. The ATIS audio is assembled from either a pre-recorded library of words and phrases, or by direct Synthetic Speech, from the text of the individual items that comprise the ATIS. The result is broadcast repetitively over a VHF radio channel. Items contained in the ATIS can be updated by direct operator input, AFTN messages, or an Automatic Meteorological instrument system. (AWOS). The system supports D-ATIS downlink and uplink messages in ED-89A format, including Contract D-ATIS, and serial RS232 or MATIP TCP communications connection to an Air Ground Service provider. 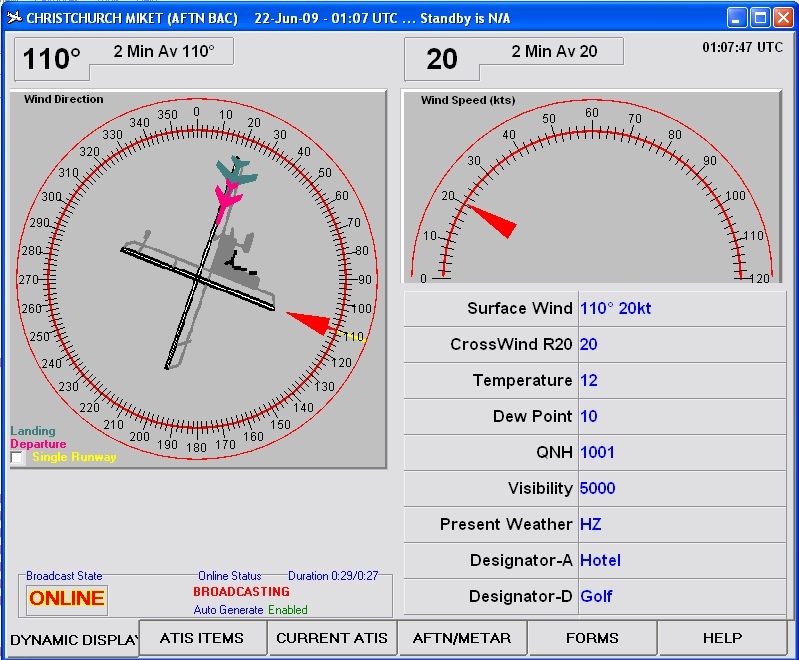 DYNAMIC DISPLAY tab shows a graphical representation wind speed and direction and selected other ATIS data in tabular form. ATIS ITEMS tab displays the aerodrome status for each of the 16 categories recommended in Annex 11, as well as any other local aerodrome notification items. An operator can modify and 'record' any ATIS phrase using Text to Speech, microphone, or Airport instrumentation. Individual items can be included or omitted from the ATIS broadcast as required. In fully automatic mode, new ATIS data is extracted from automatic Meteorological instrumentation or update messages from the AFTN. CURRENT ATIS tab displays the text of the currently broadcasting ATIS with the in-progress phrase highlighted. ATIS broadcast Continuous or during Airport operating hours only.